I recently got invited on a trip to Key Largo and Key West for a week long adventure with my long time boyfriend, his mom Kim and his younger sister Ashleigh . I was not aware that this would such a long and scary adventure and i am a complete wuss. First we had to find a rental car big enough to fit my bf and all 3 girls with our 3 suitcases each. I thought i would have a lot more trouble but a friend had previously told me to check with Rental Car Momma and see if that was any help with finding a minivan to use for the trip. I found a rental minivan thru Thrifty in seconds with plenty room so we were comfortable and only 269.99 for the whole week! So we are on the road into Key largo and it is literally a 2 lane highway with ocean on both sides! Once we arrived in Largo we headed straight for the snorkeling tour and Boy was it a blast. We went out to the site in a glass bottom boat seeing a Ray and some very colorful fish but nothing like what we saw when we got to jump into the water to snorkel. 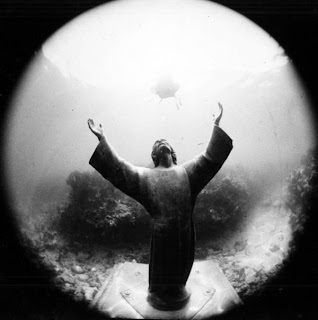 In key largo we also got to go on a fishing charter and got to go far off the coast and snorkel down pretty deep to see a life size statue of Jesus that was a home to millions and millions of schools of fish. After 4 days of sun and sand we were about ready to head over to key west (which is 6 more hours). The reason for the 3 stop trip was because his mother was very interested in the history of the keys and for the most part Key west itself. We made in at late night and went straight to bed. The next morning at the top of things to do was a old creepy museum to see The Enchanted Robert Doll. He is a legend in Key West for haunting a very old house in the heart of town. We spend most of the day exploring some creepy museums and graveyards and all night. We decided to go do a ghost tour and to a old Theater that has a strong no smoking policy once inside. The reason for the policy is because it had been purposely burnt down and they bad past experiences with people getting hurt in side the building if they has lit a cigarette by unknown causes. Well of course my boyfriend knowing the strict policy lights a cigarette and nothing happened so we thought. Well maybe the ghost must not be here tonight. WE WERE SO WRONG!!! While walking back the car from the theater, Kim's leg started itching so bad it had became hard to walk so we stopped under a light pole and took a look. She has a huge rash from her ankle to her thigh on one side and the other was growing rapidly. When we seen this everyone turned around and we rushed back to the guide. He told us this happens a lot and they are starting to reconsider letting people into the theater anymore. He showed us other pictures of people with the same rash from the same Haunted Theater. If you guys are ever in Key West, you have to go see this tour. I am still having nightmares.